what Mike put in the listing description. 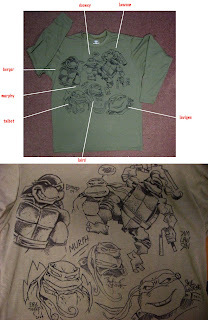 Artists who signed the shirt are; Peter Laird (TMNT Co-creator), Jim Lawson, Dan Berger,Steve Murphy, Eric Talbot, Steve Lavigne and Michael Dooney." 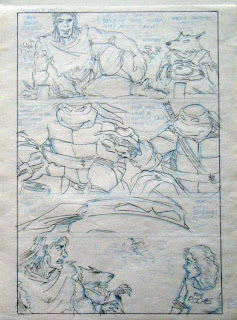 This is an oddity I found in a drawer with some other stuff -- it's yet another preliminary sketch for my cover for issue #4 of the original Volume 1 TMNT comics. 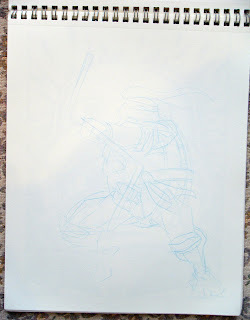 I have already posted one of these preliminary drawings (Friday, February 13, 2009: Blast from the Past #150). 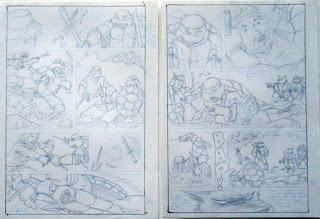 Blast from the Past #90 repost: roughs for Leonardo and Usagi story "The Crossing"
Going through some old files a few years ago, I found this interesting artifact -- eight sheets of what looked like scratch paper clipped together, with my loosely-scrawled rough layouts and dialogue for my Usagi Yojimbo and Leonardo crossover short. 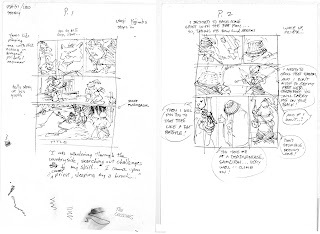 It's been a while since I last read the finished piece, but I think it pretty closely followed these roughs. 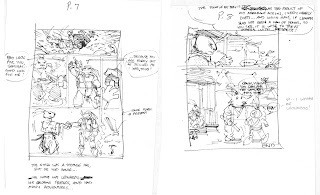 According to the folks at the very cool Usagi Yojimbo fan site (http://www.usagiyojimbo.com/), the issue of UY with this story is still available from Fantagraphics. 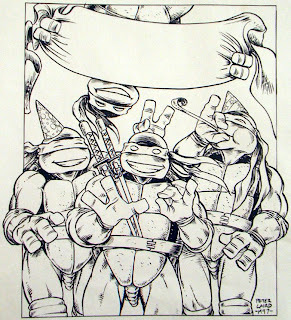 This is the front cover to a special limited edition (3000 copies) of the first issue of TMNT which was available for the first time at the Portsmouth, NH comic con on May 22 of 2004. 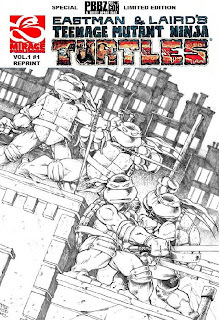 What was new about this reprint was that I had retoned and relettered it, as part of a long-term effort to "remaster" all of the old issues of TMNT. 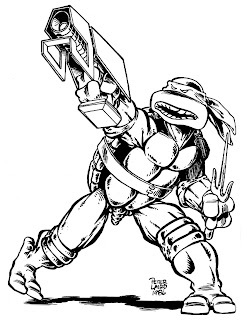 There was also an essay by Ralph DiBernardo, who -- 21 years ago -- produced the Portsmouth Minicon at which Kevin and I premiered the first issue of the TMNT. This is kind of an odd piece. 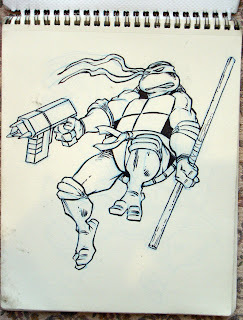 I found it in the same place as that unfinished pencil piece by Kevin Eastman (BftP #166), and for the life of me I cannot remember what I did this drawing for. 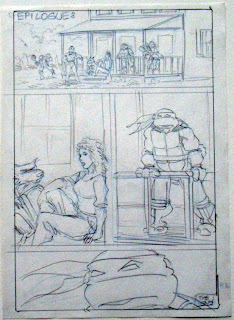 Obviously, it features two of the main characters from TMNT Volume 1 #8 -- Savanti Romero (looking somewhat different from how he appeared in the comic) and Renet -- but why did I draw it? 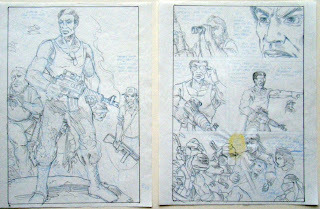 The layout of the drawing makes me think this might have been intended either for an ad or a pin-up. This is an artifact from the days when I sponsored a motorcycle racing team that we called "Team Mirage". All the racers rode TMNT-themed bikes, and Dale Quarterley was our road racer, competing in the AMA superbike class. 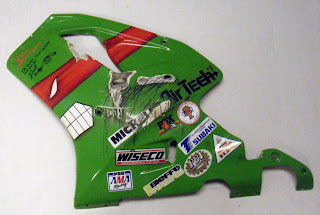 Dale gave me this side panel from the fairing of his Team Mirage Kawasaki race bike. It bears the scars from a crash he had in 1992 at the Mid-Ohio race course. I attended that race, having ridden out to Ohio with some motorcycling friends, including Gary Richardson (who also ran Team Mirage for me, and did a great job of it), Ed Smith and Jim Lawson. I can't remember if it was oil or water on the track that made Dale hit the deck, but he did, and the bike slid across the pavement for quite a ways. You can see the gouges where the pavement abraded the pant and plastic of the fairing panel. 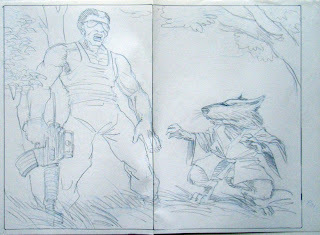 Here's the rest of the stuff from that sketchbook. 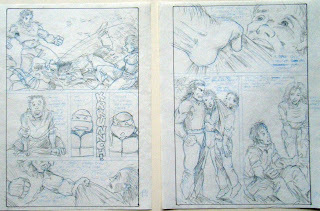 Most of these are a little hard to see, given that they were lightly drawn in photo blue pencil. 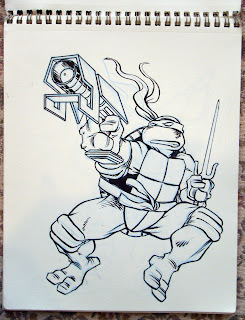 The first one is Leonardo wielding the "Sword of Tengu". 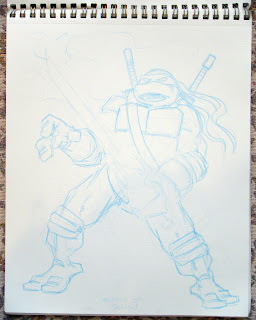 ... and Leonardo with a kusari-gama. I'm not sure why I did this one, other than the fact that it was fun. 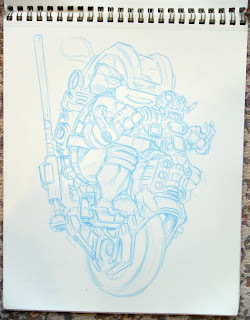 I like this wacky one-wheeled vehicle -- looks like something Donatello might cook up in his spare time. 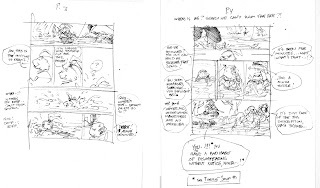 Here are a few more pages from that sketchbook. A few years ago, I did some art specifically with the aim of having it used on some licensed products. 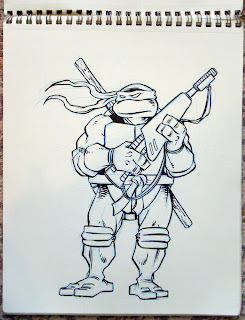 It may seem odd, but most of the art that has been used on the huge number of licensed TMNT products has been done by other artists, and I wanted to get a few things with some of my art on them. 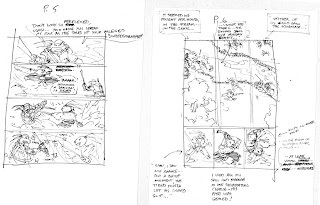 So I started to put together a bunch of drawings which we were calling the "Peter Laird Signature Series", and added a small section in our official "Style Guide" with this art, in case any licensees wanted to use it. 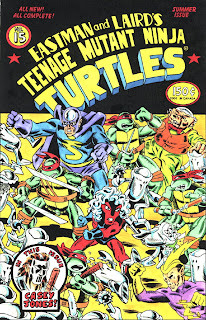 You'll note that while I drew these Turtles in my own style, I omitted the tails to keep them consistent with the other licensing art. A few licensees used the art, which was cool, but I wish more had, especially on products like t-shirts and stuff that I could actually use. In any event, it was fun to do the artwork. 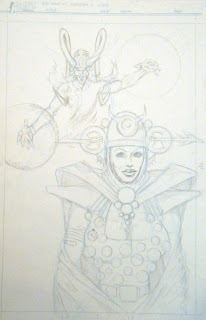 I started on a second series of drawings which I would have finished if there had been more interest in this stuff. 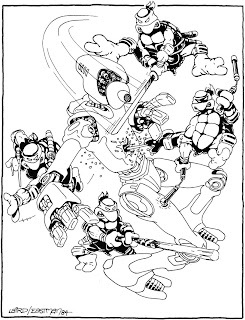 Given that I had already produced a number of drawings of the different Turtles with their signature weapons, I thought it might be cool to do some with the Turtles wielding different weapons. 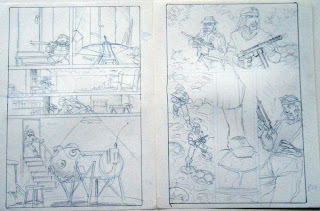 The following are some that I finished inking, and some that are still in the (blue) pencil stage. 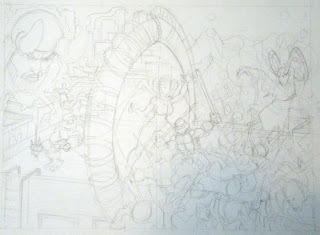 Maybe I'll get around to inking them one of these days. ... and Don with a Federation rifle. 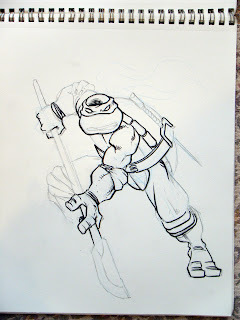 In this one, Raph is using a bladed staff (this weapon has a specific name, which of course I can't remember right now). 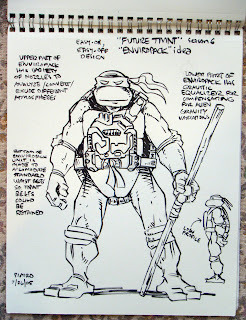 Way back when Kevin and I first started going to comic conventions and store signings, we quickly learned that quite a few people wanted more than our quickie Turtle head sketches -- they wanted full TMNT sketches (more people, in fact, than we usually had time to accommodate). 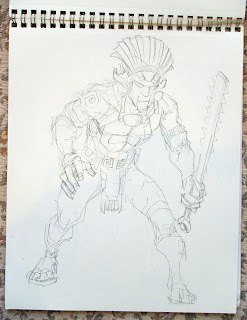 So for a few years we started doing sketches before going to shows so we would have some ready for those fans. We each did quite a few of these, and made copies of a lot of them. 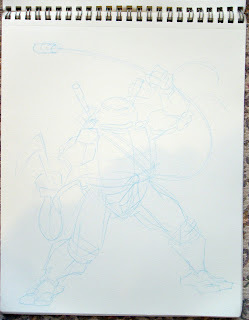 They were usually portraits of one of the Turtles, though occasionally we did group shots. 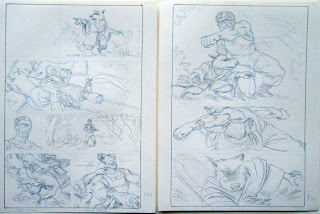 Sometimes we even collaborated on these sketches, one of us penciling and the other inking. 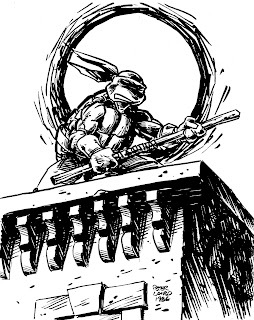 Here's one of mine from 1986, a shot of Donatello on a rooftop, with what I suppose is the moon behind him. Here are a few more things from that small sketchbook. 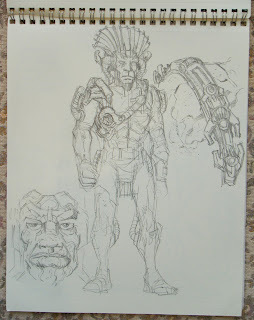 These first two are concept sketches for the "stone Generals" from the 2007 TMNT movie. I really like the pose in the second one. 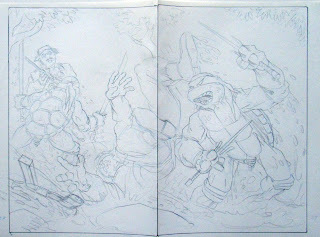 I ran across this small sketchbook while cleaning up yesterday, and discovered that it contained a few interesting things from a few years ago. 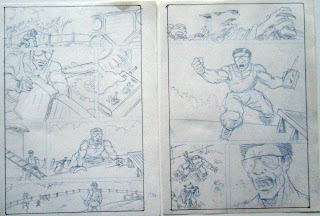 Looking through it took me back to when I used to draw like this in sketchbooks all the time, filling them with all kids of disparate things. These days, I rarely do this. 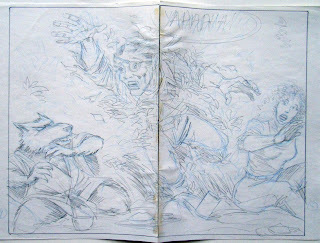 This first page kind of epitomizes for me what a sketchbook should be -- a place to work out ideas. 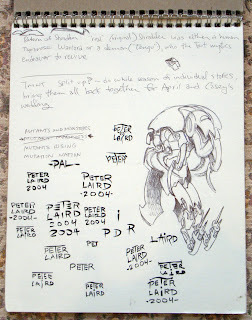 Here I have a few notes for the 4Kids TMNT show, concepts for a "Peter Laird" signature to be used on some licensed products, and one wacky-looking mouser variant. 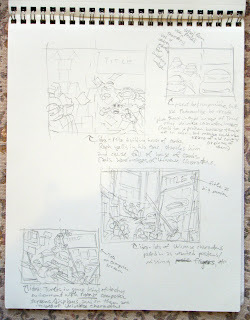 On this next page, I was trying out different layouts for the "TMNT Universe" book. 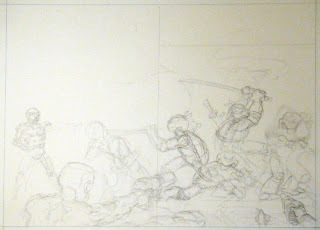 I think I went with a variant of the one in the lower left-hand corner for the finished art. 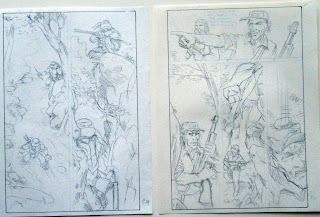 Years ago, when I did issue 15 of the original TMNT comic book series, I wanted to tweak the cover to make it look like an old comic book which had "been through the war", as they say. I penciled the art, created a new logo, and designed the cover in the style (or at least my approximation of it) of the classic "Golden Age" superhero comics. 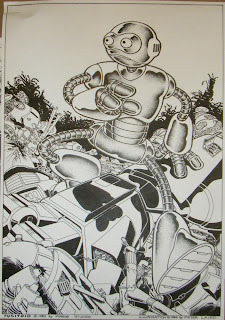 Ryan Brown did a fabulous job inking it, incorporating a lot of that "Golden Age" flavor. 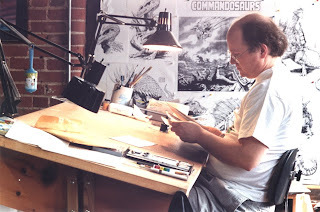 Steve Bissette told me about a copy shop in Wilmington, VT which could print color art on slick paper. 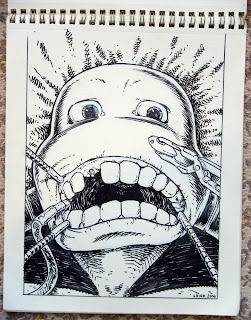 I had them make a couple of copies from my hand-painted art, then left one of them on the floor of my car for several weeks to begin the "distressing" process. Later I enhanced it with judicious tearing and application of "coffee" stains (actually brown ink), scotch tape, and so forth. 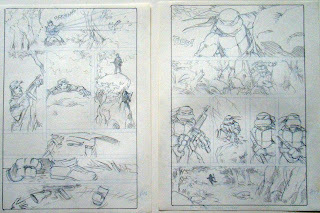 I ran across these yesterday while looking for (and not finding) my layouts for the Donatello One Issue Micro-Series, and decided to post these instead. 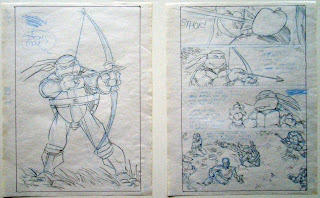 (I'll find those Donatello layouts one of these days.) Although I originally thought I would spread these out over a week or so of postings, I changed my mind a few minutes ago and decided to do them all at once. 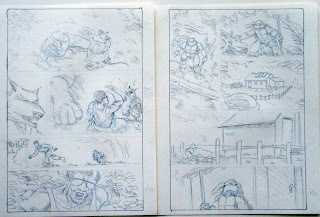 The following are my penciled layouts for issue #12 of the original TMNT comic book series. 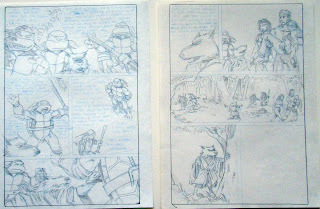 This was -- and still is, I think -- the only full-length TMNT comic book on which I handled all of the art and story chores (the lettering was done, I believe, by Steve Lavigne). 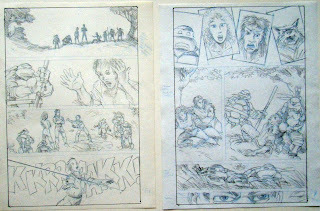 This issue is somewhat significant because it marked the end -- or, perhaps more accurately, the beginning of the end -- of my creative partnership with Kevin Eastman. 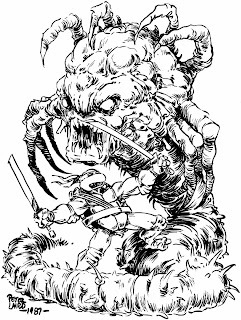 With the burgeoning success and accompanying stresses of the TMNT licensing program, then (in 1987) kicking into high gear, Kevin and I had gotten kind of sick of working with each other. 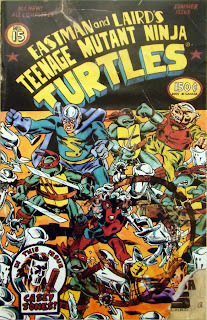 It had become very difficult to produce an issue of the TMNT comic book without a lot of unpleasantness and disagreements. It got to the point where we both realized that something had to change. 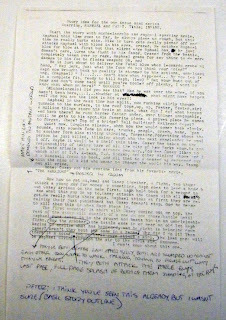 I remember we had a short meeting in Pulaski Park in downtown Northampton, wherein we decided that we should take a break from each other, and alternate issues of the comic -- I'd do one, he'd do the next, and so on. 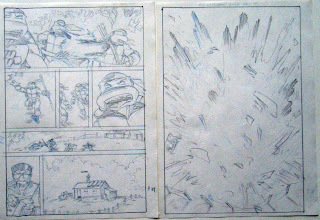 It fell to me to produce the next issue -- I can't remember exactly how we came to that conclusion... perhaps I already had a story, perhaps Kevin was too busy with something else. I don't know. 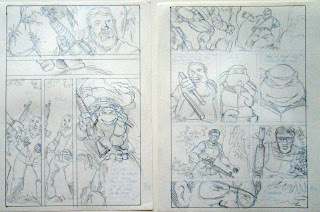 But the long and short of it was that, for the first time, I wrote, penciled, inked and toned an entire issue of the TMNT book, by myself.